The spirit and entrepreneurial mastermind behind the breakfast klub and Reggae Hut Café, Marcus Davis, is best known for his charismatic personality, authentic kustomer appreciation, and his tireless kommitment to the kommunities he serves. Applying “kommunity” as his guiding principle in his business and personal life, he has kreated one of the most phenomenal restaurant success stories in the country. The koncept for the breakfast klub was born after Davis, a native Houstonian, rekognized a void in the market for a unique breakfast restaurant serving signature items in a soulful, relaxed kommunity environment. He chose two of his favorite dishes from opposite ends of the country – “Katfish & Grits” from the East Coast and “Wings & Waffles” from the West Coast, and the rest is history. Since opening in September of 2001, the breakfast klub has become a top tourist attraction, as well as the local favorite breakfast spot, lining up droves of cheerful patrons on a daily basis. It konsistently receives rave reviews, including recognition as the best breakfast in the kountry by “Good Morning America,” USA Today, Esquire Magazine, and Forbes Magazine. Locally, the breakfast klub is touted by the Houston Press as the 2011 Readers Choice for best breakfast, winner of the 2011 My Table Culinary Award for favorite breakfast, and Best Of Citysearch 2011 winner in the breakfast category. The Reggae Hut, a longstanding staple in Houston’s Third Ward kommunity, specializes in authentic mouthwatering Caribbean specialties; it also fills a niche in Houston’s growing ethnic kommunity. 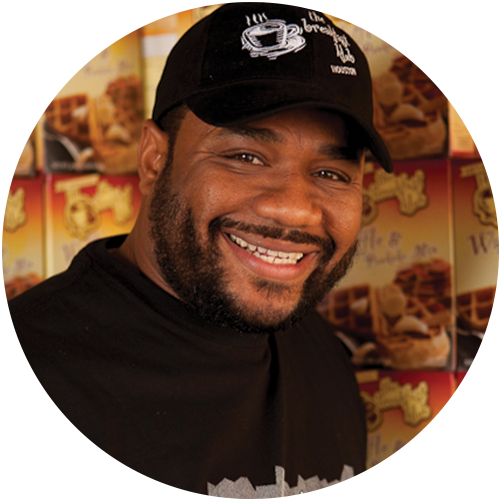 The restaurant served as a konsiderable inspiration to Davis during the breakfast klub’s formative years, helping to hone his skills as an entrepreneur, business owner and award-winning restaurateur. The successes of the restaurants have led to the development of branded konsumer products for the home that include the breakfast klub koffees, along with a Waffle & Pankake Mix and Soulful and Savory Seasoning Mix, with others kurrently in development. Davis earned a Bachelor of Arts in Political Science at Texas Southern University. He is the host of the weekly radio show “Sunday Morning Live” on Radio One‘s KMJQ 102 FM, and is a highly sought after business and motivational speaker. He kredits his success in keeping God first and the support of his family. Not surprisingly, he places a special emphasis on spending time with his four “beautiful girls,” wife Mel, mother Betty, and two daughters Lundyn Cymone and Bailey Harrell, and son Joshua Raymond.